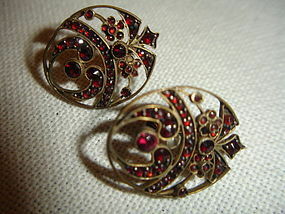 Fabulous Gilt Sterling Bohemian Garnet Earrings. They measure over 1 inch long. I believe they are Edwardian based upon style. Screw backs are hallmarked Sterling. Condition is very good a bit of gilt wear, very minor. Stunning.